His ghost rides forth from to the scene of battle in nightly quest of his head...sometimes passing the Hallow like a midnight blast. What could possibly be more terrifying than the headless horseman? Well, Christopher Walken as the headless Hessian, from the movie Sleepy Hollow. Sure, his headless form in that movie was creepy, but his head with pointy teeth was even more horrifying. But you don't want to be that level of scary. No you want to capture the essence of the headless horseman...and by that we mean the headlessness. You don't want to have a head. The whole point of the Headless Horseman is that he is HEADLESS. You want to walk down the street on Halloween, and have people know who you are. 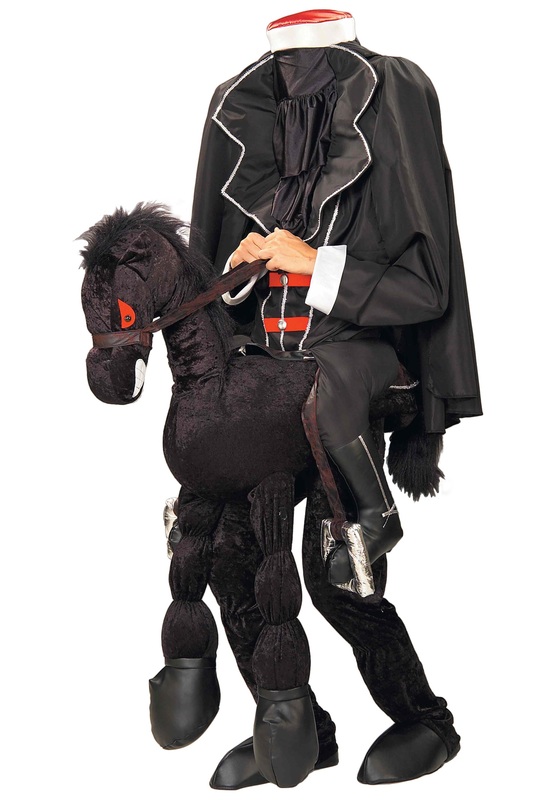 This Headless Horseman Costume captures the essence of all that is the Headless Horseman. (Mostly that he is a riding a horse, and headless.) You'll be galloping through your neighborhood, jumping out at folks. They will scream as they see your horse's evil red eyes, then they will realize that you are just a bloody neck stump right before you run off to give a good fright to your next victim. They will be afraid, and not because you look like Christopher Walken's version of the headless Hessian with pointy teeth. The newspapers the next day will read "Headless Horseman Spotted Again!" And "The Hessian Spotted in the Hallow!"